The soldier slang of World War II was as colourful as it was evocative. It could be insulting, pessimistic, witty, and even defeatist. From 'spam bashers' to 'passion wagons' and 'roof pigs' to 'Hell's Ladies,' the World War II fighting man was never short of words to describe the people and events in his life. 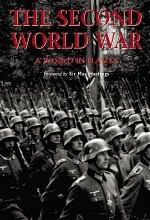 F***ed Up Beyond All Recognition takes a frank look at the British, Commonwealth, American, German, Japanese and Russian slang used by the men on the ground, and shows how, even in the heat of battle, they somehow managed to retain their sense of humour, black though it might have been.